Karaoke Online : Application that help you Sing and Record songs easily, conveniently. Karaoke Online has lot of songs, include many new karaoke songs in 2017, you can search easily and sing karaoke all day right on your phone / tablet. - Sing new songs, sing favorite songs anytime. - Sing karaoke online with video. - Search karaoke songs easier with Talk To Search feature. - Record while singing karaoke with high quality. - Have fun with your friends by Karaoke Online Score feature or send your recording files to your friends. And lots of other gadgets for you. - Application support Android 4.0.3 and up. - Application requires RECORD_AUDIO Permission and WRITE_EXTERNAL_STORAGE Permission to record karaoke songs and save to storage. 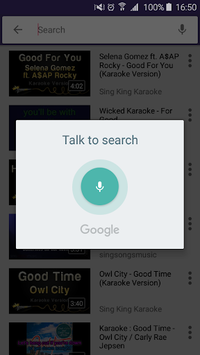 - When you use voice to search karaoke songs, let's use the default language of your phone.